I have been going through a period of deep spiritual struggle. It has been the kind of struggle that bears much fruit. These struggles are deepening my faith and teaching me to rely on Christ’s will for me, rather than my own will. My eyes have been truly opened to different aspects of Christ’s betrayal and the Cross. Today revealed to me just how much God’s grace is working in me. The only source of my understanding is Him. Today is the 13th anniversary of the 9-11 terrorist attacks. It is a deeply difficult day for thousands of people personally, and a day of mourning and remembrance as a nation. The last 13 years of my life have been shaped by my 9-11 experiences. Three years after my relief work, I suffered through a few years of debilitating PTSD. After absolutely stellar treatment from some of the world’s top EMDR and PTSD specialists, I have been able to live with those memories. I live with next to no PTSD symptoms, from that period in my life. One aspect was still in need of healing and that was a spiritual dimension. As Christians, we are called to pray for our enemies. As Catholics, that includes the dead. I have never been able to bring myself to pray for the 19 hijackers, until today. At 9:37am this morning, at the exact same time Flight 77 slammed into the Pentagon, killing 184 people, I started to pray a Rosary before holy relics of Our Lord’s Cross (yes, the actual Cross of Jesus). As I started my Rosary, I began to list my petitions: the families of the killed, those killed, the relief workers, etc. Then I got the thought to pray for the terrorists’ souls. At first, I could not utter the words. I began to sob in utter agony. I fell onto all fours and sobbed uncontrollably for a few minutes. 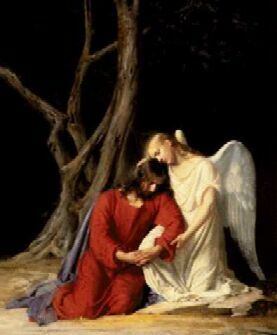 I had the sense (eye of faith) that my Guardian Angel was there comforting me. The Agony in the Garden came to mind. I finally got back up on my knees and through my sobs, prayed for the souls of the terrorists and those who terrorize today. It was the hardest Rosary I have ever prayed in my life. I sobbed and shook throughout it, but I knew Our Lord and Our Lady were with me. When I finished, I felt like a huge weight had been lifted off of me. The sobbing stopped and peace set in. Some of you will read this and respond in anger. Some of you will not understand praying for the souls of the dead, especially those who chose evil. Catholics, unlike a lot of other Christian denominations, pray for the dead constantly. But, some of you will understand why this is significant, and why it is necessary. I had to walk into the Garden and cry out in agony. I chose courage. I walked towards the Cross. Something that I have avoided for well over a decade. I knew those prayers would be hard. It is only by God’s grace that I was able to utter them. To release my own anger at those 19 men, who murdered so many, and left me in the throngs of PTSD 10 years ago. This was God’s doing. In choosing to let go, He was able to heal my hurt. It is hard, but in confronting deep pain, with God as our guide, we are set free. What agony do you need to confront? Let God heal you. I had the exact same reaction when I was instructed to pray for the terrorists during a Rosary on the 5th anniversary. I did it, but sobbed and cried the entire time. I have always known it needed to be done. The experiences were so raw and my anger so intense that I couldn’t bring myself to do it. Not only had these men robbed thousands of people of loved ones, they terrorized me in nightmares and night terrors for a period of 3 extremely difficult years of hard fought PTSD.